I am a professional masseur. I provide a massage that works all the muscles of your body and aims at optimal stress release. My de-stressing care combines two techniques : Swedish provides full-body muscle relaxation and it can be helpful if you are recovering from an injury, and Californian for softness and benevolence of touch. 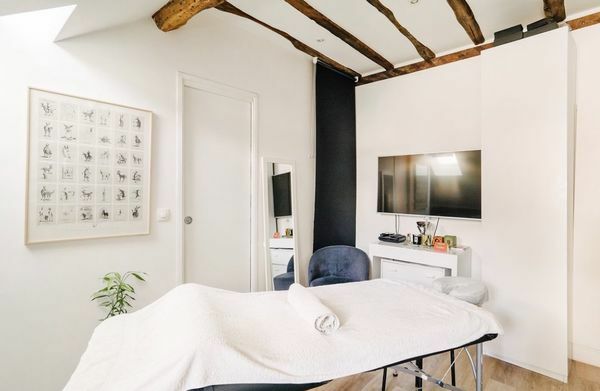 Safe, clean and cute studio with comfortable massage table and organic oil. Straight, Gay, or Bi, my massage is going to leave your mind and body...More as well. You can make an appointment by writing me an email or SMS/WhatsApp. Activity carried out within a strictly legal professional and tax framework. Gathered by Othmane from admiring massage clients to share with you. Great guy, super polite, didn't make me feel bad for not figuring out which door to enter and how to enter the code, he came down to get me... And most of all, the massage was very relaxing. I will go back ! J’ai eu à faire 2 fois à Othmane et j’en suis ravi. Il est sympa, à l'écoute. Il est très professionnel. Le massage de 1h15 aujourd’hui m’a bien détendu, j’ai même failli m’endormir au massage de tête. Je le recommande à tout le monde. Overall a great experience and wonderful massage. Othmane is very professionnal and kind. Highly recommend !! if you are looking for a relaxing professional massage, contact Othmane. He has incredible hands. I had him come to my hotel after my day’s work and he arrived on time, very smiling, kind and listening. He climbed into the room with his massage table and moved quickly. I loved his massage and I called him to come again the next day and two days later. I recommand. What's a magic hands !!! Thank you a lot for this wonderfull massage. I enjoyed the tea and dried fruits after the massage. Othmane offered the total package: a kind and welcoming spirit, a warm and comfortable setting, and firm yet sensitive hands. I can't recommend him highly enough. Do yourself a big favor and make an appointment for a massage with Othmane. Quel bon moment de détente ! Othmane est vraiment sympa et très professionnel. J'ai testé son massage cette semaine et je ne regrette absolument pas !! J'avais des tensions dans le dos et les jambes, et il a su me détendre tout ça. Un toucher très agréable et des bonnes mains de masseur. Je reviendrai sûrement. Je recommande. I had the pleasure of a 90-minute massage with Othmane. He is always very professional and leaves you feeling perfectly relaxed. I really do recommend him!